We accept people into our research studies and we have many connections with the clinicians and clinics here at UF Health. However, if you are looking to make an appointment to see a doctor in one of the specialty clinics here at UFHealth. Please click here to see the contact information for the clinics at UFHealth.. The facility on UF’s campus is at the northwest corner of Archer Road and Gale Lemerand Drive at 2033 Mowry Road. 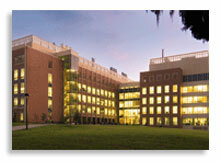 To find CNG on UF’s online Campus Map, search “Cancer/Genetics Research (CGRC) Building #1376”: http://campusmap.ufl.edu. In Gainesville, turn at FL-24/Archer Road and proceed west. Shortly past the UF Shands medical center, make a right turn (north) onto Gale Lemerand Drive. Make a left at the next traffic light (less than a tenth of a mile) onto Mowry Road. Drive slightly beyond the Cancer and Genetics Research Complex and take the next left into the CGRC driveway. Upon arrival, please request a temporary parking pass at the UF Genetics Institute administrative offices, which are located in the North Wing (the elevator side). To get there, enter the hallway to the left of the elevators, make a left, walk to the end of the hall, and make a right into our offices. Want to get directions from Google Maps or a similar Web site? The street address is 2033 Mowry Road, Gainesville, FL, 32610. Take Gainesville/Archer exit 384 and merge onto FL-24/Archer Road. Head east approximately 2.5 miles to Gale Lemerand Drive. Make a left turn (north) onto Gale Lemerand, Make a left at the next traffic light (less than a tenth of a mile) onto Mowry Road. Drive slightly beyond the Cancer and Genetics Research Complex and take the next left into the CGRC driveway. Upon arrival, please request a temporary parking pass at the UF Genetics Institute administrative offices, which are located in the North Wing (the elevator side). Enter the hallway to the left of the elevators, make a left, walk to the end of the hall, and make a right into our offices. Want to get directions from Google Maps or a similar Web site? The street address is 2033 Mowry Road, Gainesville, FL, 32610.